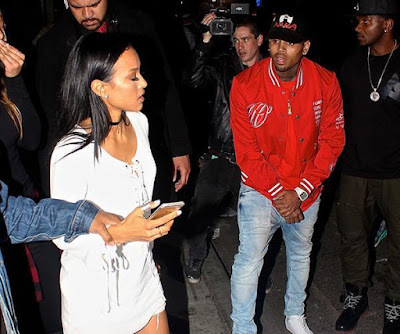 Chris Brown is eager to get back with Karrueche Tran and a chance meeting at a club last night seemed like the perfect opportunity, however, the reconciliation talks didn't go well. Infact TMZ is reporting it as a public shouting match that ended in Karrueche throwing Chris out of her car, and then walking out on him at a restaurant. In between, cops were called on Chris Brown after he made a loud nuisance banging on her front door and disturbing the neighbours. Read more below..
...the drama started inside Playhouse nightclub ... when Chris got the V.I.P. table next to the one Karrueche was at. It seemed she was there because her BFF Christina Milian was the host for the night ... something Chris clearly knew. We're told KT was pissed and left the club ... and Brown followed ... eventually weaseling his way into her SUV.. Which is why she was even more upset when he showed up on her doorstep around 3:30 AM -- banging and yelling, clearly trying to get KT to open up. Our sources say one of Karrueche's neighbors called cops because of the noise Chris was making at her door .Tran ultimately left her home -- and went to the famous Norm's Diner. Brown showed up a short time later. Once inside, we're told they began to argue and it escalated into a full-blown shouting match. Eventually, Karrueche left the restaurant and returned home -- without Chris. Bottom line -- don't expect a reconciliation any time soon.